Hi, I'm Hannah and welcome to Dogknows Northampton. 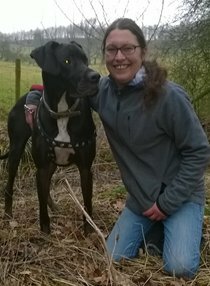 If you live in or around the Northampton area and you follow a busy schedule I can help support you with your dog's care needs. The Dogknows services are especially designed to give your dog, whatever their age, the right balance of exercise and mental nourishment and I incorporate our 'Everyday Training Skills Programme' into all of our services and you can be assured that we only use kind, positive training methods. I have worked with animals for over 10 years and have lots of experience of horses and dogs and I currently have 2 adorable shetland ponies to care for each day. I have worked in dog rescue and I loved every aspect of this, from the walking to the training, the cleaning to the cuddling, and all the smiles in-between. Please e-mail or call me directly and if easier, send an enquiry form so I can get in touch with you. Whether you have a young puppy, a golden oldie or a dog in the prime of its life, please get in touch to find out more about the individual dog care and training plans that I can offer you and your precious pet dog.